I feel somewhat this way about being a painter after having first been an art historian. Sometimes it is a deterrent to contemplate the achievements of others, but sometimes their work serves as inspiration. Though I’ve had my professional romances with Piero della Francesca, Velázquez, Vermeer, Watteau, Goya, Manet, Monet and Matisse, here I’ll focus on Edgar Degas (1832-1917). He does not seem to have been the most agreeable human being, and I probably would not have liked being around the living man one bit, but his compositions have been quite deliberate inspirations for a number of my paintings and monotypes. Like him, I enjoy random groupings of horses and other beings in motion. Eleven Headed Uphill: Opening Day, Smithtown Hunt is a distant descendant of Degas’s paintings and pastels of jockeys and horses. The immediate source for this was my photograph of what in “huntingspeak” is called the first flight. These are the best riders, who set out first in the hunt field in pursuit of their quarry. (In the case of the Smithtown Hunt on Long Island, this is a rider who has gone ahead of the pack of hounds with a spray can of fox urine, so the point of the outing is a great ride, not the killing of an animal). The randomness of the riders’ placement against a field as they galloped after the foxhounds, and the brilliant colors of the riders’ and horses’ coats were irresistible to me. Homage to Degas: Chelsea Dogs—a trio of New Yorkers waiting for their dog walker—owes more to his many images of dancers offstage and to his early portraits. It was the seemingly studied lack interest of these dogs in one another that made me think especially of Degas’s portrait work, not just of dancers resting or doing repairs between performances. He had an uncanny ability, best demonstrated in his double and group family portraits, to observe the emotional distances between or among family members, and to express these compositionally. 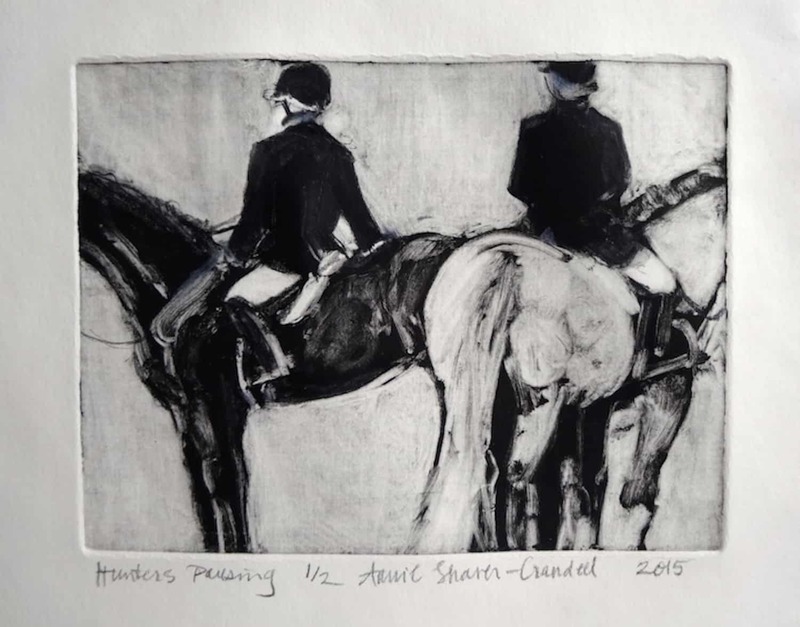 Hunters Pausing, a recent monotype, is a double homage, in a way, as I first became aware of the monotype medium through the work of Degas. Again, my source was a photo of members of the Smithtown Hunt as they waited in the woods for the rest of the hunt field to catch up. The torquing of the human body that riders and dancers do to rest their backs seems to have appealed to Degas in his choices of views of them was also what caught my eye here. His arbitrary truncation of scenes—probably much influenced by his exposure to Japanese woodcuts, as well as his own experimentation with a box camera—gave me permission even as I took the source photo for this work to lop off the horses’ heads. Degas is just one among many “giants” for me as an artist, but I’ve chosen him in particular because his work continues to feel to me so completely present, and continues to inspire me. 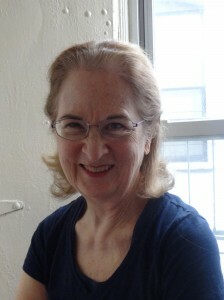 Annie Shaver-Crandell holds a doctorate in art history from Columbia University, an M.A. from the Institute of Fine Arts of New York University, and a B.A. from Oberlin College. In her first career, she was a medievalist, author of The Middle Ages in the Cambridge History of Art (1982) and co-author, with Paula Gerson and Alison Stones, of The Pilgrim’s Guide to Santiago de Compostela: A Gazetteer (Harvey Miller Press, 1995). For more than 30 years, she taught art history at the City College of New York, from which she retired to paint full-time. Lovely to read …. made be think of this- that we all stand on the shoulders of giants. Perhaps another way i think about it is that, like cells in a complex being or organisms in an ecosystem, we are have a role, a niche, a purpose – in the great cycle of creation and destruction. The root of your writing whilst sounding agreeable originally, did not settle perfectly with me after some time. Someplace throughout the paragraphs you managed to make me a believer but only for a short while. I nevertheless have a problem with your leaps in assumptions and one might do nicely to help fill in those breaks. When you can accomplish that, I would definitely end up being impressed.